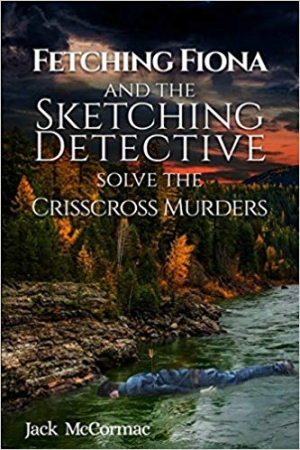 Fetching Fiona and the Sketching Detective Solve the Crisscross Murders is an excellent escapist mystery whose lighthearted characters solve crimes while living in small-town bliss. Jack McCormac’s snug, cozy murder mystery Fetching Fiona and the Sketching Detective Solve the Crisscross Murders embraces kooky characters, humorous dialogue, and two fairly bloodless crimes. At the center is the MacKay couple—an architect and a professor who love antiques, food, the mountains, and solving mysteries. The body of a wealthy accountant, Randall Evans, is discovered disguised as a one-eyed witch near the town square of Bonnie Glen, Georgia. It turns out that Randall was poisoned by belladonna, a natural toxin that has been used for murder for centuries. The next to die is another accountant, Walter Palmer, who is found facedown in a river with an arrow in his back. Palmer and Evans were cousins and related to the wealthy Nichols family. “Fetching” Fiona and her husband, Jack MacKay, begin to suspect that Nan Evans and Mildred Palmer killed their husbands for money. The only problem is that neither suspect was anywhere close to Bonnie Glen, and both suffer from phobias that would seemingly make murder out of the question. Despite its genre, there is really no mystery in this book. Fiona figures out who the killers are early on, and their motivations are never in doubt. The actual mysteries involve whether another character is a member of the Nichols clan, as well as a side issue with a rash of stolen cars. The latter is not solved, though Fiona does figure out elements of the thefts. Clever writing characterizes the book, but its eccentricity sometimes feels overdone; little feels realistic in the MacKays’ world, where small-town cops hire amateur sleuths, who are all too able to pull out confessions from cold-blooded killers and who are able to solve cases after a bit of rumination in an old chair. In order to appreciate this mystery, the suspension of disbelief is a must. The prose is repetitive on a page-by-page basis, with Fiona constantly reminding Jack not to fall for a pretty face. There are far too many parenthetical comments, Nan and Mildred often repeat themselves, and Fiona and Jack go overboard discussing their love of antiques. Still, this short book makes for pleasurable reading.